Coherent X-ray diffraction imaging (CXDI) is a lensless imaging technique for visualizing the structures of noncrystalline particles at a resolution of several tens of nanometers. The targets are particles with dimensions in the sub-micrometer to micrometer range. We carried out CXDI experiments at 66 K to investigate the internal structures of a whole frozen-hydrated cell and a chloroplast of Cyanidioschyzon merolae and a cyanobacteria cell by using coherent X-ray light sources, such as synchrotron and X-ray free-electron laser facilities. Owing to the short wavelength of the X-rays used (0.225 nm), the absorption and multiple scattering of X-rays inside the specimens were negligible. Diffraction patterns from each specimen particle adsorbed onto a thin membrane were collected at resolutions better than 50 μm−1 in reciprocal space. Therefore, structures of specimen particles can be illustrated at a resolution higher than 200 nm in real space. The most probable electron density map was retrieved from each diffraction pattern. 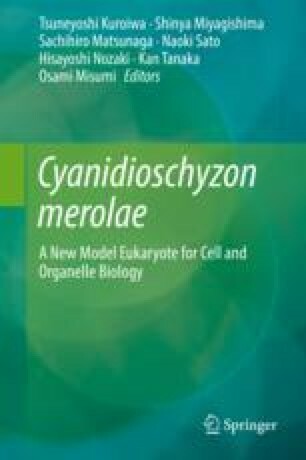 The internal structures of the specimens are described here, particularly the structural correlation of the chloroplast of C. merolae and the cyanobacteria cell. Based on the experimental results, we discuss the feasibility of CXDI in the structural analyses of biological cells and cellular organelles. The authors would like to thank Dr. Kensuke Tono, Dr. Takashi Kameshima, Dr. Yasumasa Joti, and the members of the engineering team of SACLA for their great help in XFEL-XCDI experiments. This study was supported by a grant for XFEL key technology and the X-ray Free-Electron Laser Priority Strategy Program from the Ministry of Education, Culture, Sports, Science, and Technology (MEXT) to M.N., M.Y., and S.M. ; Grant-in-Aid for Scientific Research on Innovative Areas from MEXT [Nos. jp15076210, jp23120525, jp25120725 to M.N., and Nos. jp24113723, jp26104535 to T.O. jp25120726 to S.M., and jp25114514 to S.M. ], Grant-in-Aid for Scientific Research (A) from the Japan Society for the Promotion of Science (JSPS) [Nos. 17654048 and jp16H02218 to M.N. ], Grant-in-Aid for Scientific Research (B) from JSPS [jp11558086 to M.N. and jp26291067 to S.M. ]; Grant-in-Aid for Young Scientists (B) from JSPS [jp26800227 To T.O. ], Grant-in-Aid for Challenging Exploratory Research from JSPS [jp17654048 and jp24654140 To M.N. ], Grant-in-Aid for Research Activity Start-up from JSPS [jp25891033 to Y.T. ], and Grant-in-Aid for JSPS Fellows (No. jp15J01707 to Y. S., No. jp15J01831 to A.K. ); RIKEN Special Postdoctoral Researchers Program to Y.T. We collected diffraction data in cryogenic XFEL-CXDI experiments performed at SACLA (Nos. 2013A8043, 2013B8049, 2014A8033, 2014B8052, 2015A8051, and 2016A8048). The phase-retrieval calculations and multivariate analyses were performed using the mini-K supercomputer system at the SACLA facility.